Let these Steampunk Heart Gear Key Earrings unlock your heart. 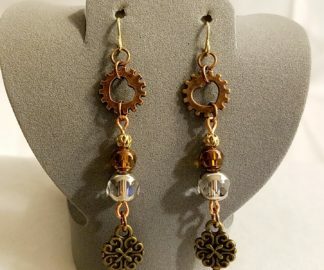 This pair of Steampunk Heart Gear Key Earrings are delightfully charming in a retro-futuristic sort of way. 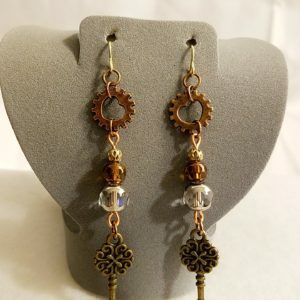 This pair of Steampunk Heart Gear Key Earrings are delightfully charming in a retro-futuristic sort of way. Made with a gear that has a heart in the middle as well as Cathedral glass beads in clear and Topaz. Dangling at the very end of all this is an Antique looking small key with hearts also. Adding them to an outfit will give it a touch of glitz and glamour with a hint of Victorian flair. Cathedral Beads - Lovely pastels, deep purple and emerald and striking jet black with vividly colorful ends resembling sparkling bead caps. They are made by pressing into a steel mold, coating the bead with metalized color, then grinding and polishing each facet to reveal the brilliant glass base. All beads are colorfast and consistent throughout the line. They were given their name because their glowing facets and brilliant metallic trim are reminiscent of the beautiful stained glass windows in old churches. are made with no lead content you'll see the way the light shines through the bead like a stained glass window. Perhaps that another way they got the name "cathedral glass beads"! Steampunk is a subgenre of science fiction or science fantasy that incorporates technology and aesthetic designs inspired by 19th-century industrial steam machinery. Although its literary origins are sometimes associated with the cyberpunk genre, steampunk works are often set in an alternative history of the 19th century's British Victorian era or American "Wild West", in a post-apocalyptic future during which steam power has maintained mainstream usage, or in a fantasy world that similarly employs steam power. Therefore, steampunk may be described as neo-Victorian. 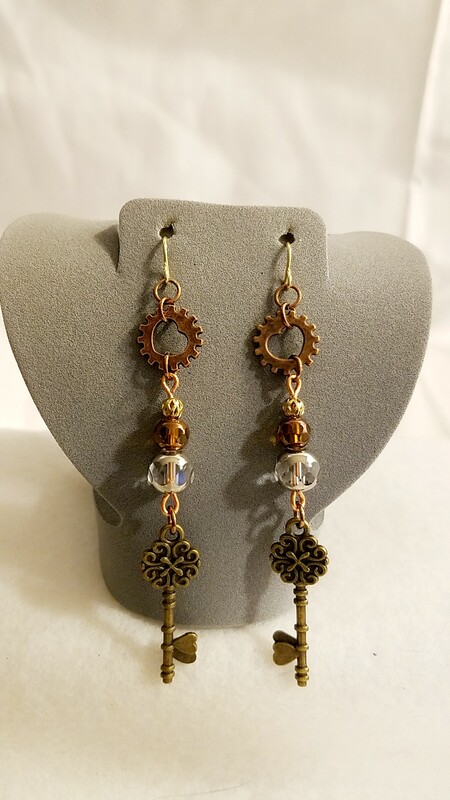 If you would like to know more about the gemstones, rings, and items that are used in making handmade items like this, Steampunk Heart Gear Key Earrings; please take a look at the Material Description Page and my Chain Maille Descriptions page.